U.S. light-vehicle demand has increased 1.1 percent this year through August. Even with strong economic and employment growth, many analysts expect volume to soften the remainder of the year as rising interest rates, trade fears and higher new-vehicle prices discourage some consumers. U.S. light-vehicle sales in September are expected to fall from unusually high levels a year ago, when new car and truck demand surged in the aftermath of Hurricane Harvey. Forecasts from Cox Automotive, Edmunds and J.D. Power/LMC Automotive project sales of about 1.4 million vehicles this month, a roughly 6 to 8 percent slide from September 2017. "Year-over-year comparisons are challenging this September, as the industry saw record sales levels last year," Charlie Chesbrough, Cox senior economist, said in a statement. He also noted that September has one less selling day than a year ago and there's less replacement demand from seasonal factors compared with a year ago. J.D. Power/LMC expects sales to decline 6 percent, while Edmunds forecasts an 8.3 percent drop. Cox predicts sales will be down 7.2 percent. Automakers are scheduled to report September sales on Tuesday, with transactions closing on Monday, Oct. 1, counting toward September. All three of the forecasts call for the seasonally adjusted annual rate for September to rise to or above 17 million for the first time since June. That still would be well below the SAAR of 18.2 million in September 2017, when replacement demand and delayed purchases after Hurricane Harvey struck Texas resulted in the highest selling rate since 2005. 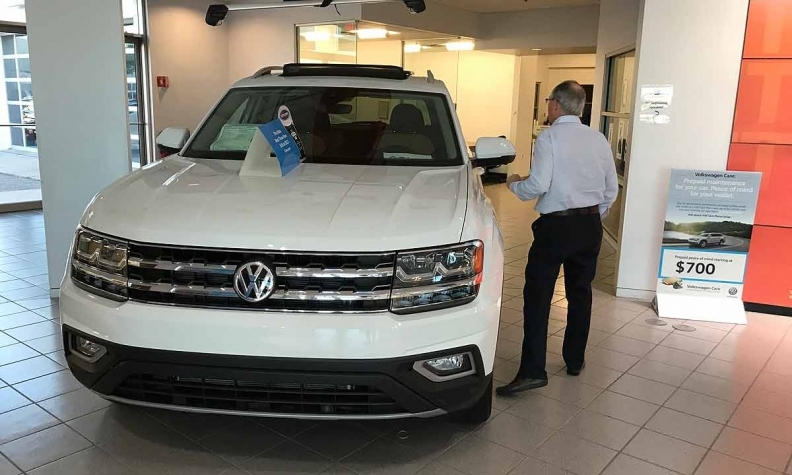 "Vehicle replacement demand following Hurricane Harvey bolstered auto sales last September, and Hurricane Florence has had a very limited impact on auto sales this month, which are the primary reasons why we're seeing this year-over-year decline," Jeremy Acevedo, Edmunds' manager of industry analysis, said in a statement. J.D. Power said sales in the Carolinas through the first three weeks of September were down 12 percent because of Hurricane Florence, which hit East Coast states this month and caused massive flooding. While substantial, the damage caused by Florence, a Category 1 storm, was minimal compared with other hurricanes, such as Harvey, that hit more densely populated regions and generated significant replacement demand. U.S. light-vehicle deliveries have increased 1.1 percent this year through August. Even with strong economic and employment growth, many analysts expect demand to soften the remainder of the year as rising interest rates, trade fears and higher new-vehicle prices discourage some consumers. Most major manufacturers are expected to post lower September sales, led by decreases of about 15 percent for General Motors and 10 percent at Ford Motor Co.
FCA US is projected to be the only major automaker with substantial gains for September, up as high as 9 percent from a year ago, behind Jeep volume. J.D. Power said the average new-vehicle retail transaction price to date in September was $32,003, an all-time monthly record. The previous high for the month, $31,543, was set last year. The rise in transaction prices comes as automakers cutback on incentives. Average incentive spending per vehicle to date in September was $3,910, down from $4,061 during the same period last year, according to J.D. Power. It would mark a third-consecutive month of declines. "While the auto industry has exhibited mixed health signals, there have been some improvements in recent weeks and vehicle sales have quietly maintained a solid pace," Jeff Schuster, president of LMC's Americas operations and global vehicle forecasts, said Thursday in a statement. "Trade and rising interest rate risk remain real factors in the background, clouding investment decisions and potential future consumer purchases." Cox said it expects rising interest rates and gasoline prices to contribute to a slowdown in the fourth quarter. It also said the Trump administration's steel and aluminum tariffs could hurt sales by compelling automakers to restrain their incentive spending.